For Ms Tersigni, she wanted to create a website for all of her classes. She did not have a specific host site which she wanted, so we created two different sites to show her. We created one site on Wordpress and one using Google Sites. While going through the process of making the sites, we realized that it was very difficult to host a site on Wordpress. 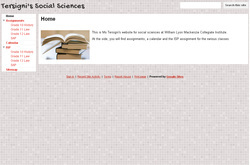 The steps involved in customizing the site were complicated, and Ms Tersigni said that she was not very "tech-savvy". Therefore, we decided to go with the Google Site, simply because Ms Tersigni already had a Google Account. Additionally, the Google Site was very simple and easy to edit and upload files. Along with the Google Site, Ms Tersigni wanted to know how to use the Google Calendar. We showed her how to create a different calendar for each class that she has. She now knows how to add due dates for each class, and in turn, the calendar on her site will show the due dates as well. Because I was part of the Clickers group, we had a Prezi presentation made regarding the use of Clickers. However, Ms Tersigni did not like the look of Prezi, and so we created a PowerPoint file which included everything the Prezi did. Ms Tersigni was also at the PD day at school, and so we did not present her with the sample Clicker presentation. Due to the wide range of applications, the use of Google Sites is pretty much useful for many school subjects. Teachers are able to add on a Calendar to show students when the due dates are. In addition, Google Sites allows instructors to upload Microsoft Word documents, which would be handy if students have misplaced a particular handout. Google Sites allows the user to insert images and videos in order to enhance the site. This would not only provide a visual for students, but would have educational value. For example, if a student had missed a particular class, the insertion of a video about the lesson would be a good way for them to make up for lost class time. Clickers is a piece of technology that is easily applicable to many different subjects. This is due to the fact that clickers can be used in many different ways: writing a test, class discussions, polling, etc. For example, in math class, the teacher could write a quiz on paper, and would be able to have the students answer using clickers. In science, a teacher would be able to do review before a test. After a particular question, a software shows the results in pie chart form. By using that function, the teacher would be able to know which concepts they would have to review to ensure that the students understand the ideas. Finally, in a business class, the teacher could show a specific business case to the class. The students could input what they think would be the best solution to the problem. Because this technology has many different functions, it would be easy to incorporate it into other subjects as well.